Loggerhead turtles nest in Florida from late April to September. An average clutch consists of about 100 eggs. The eggs incubate for about 60 days before producing two-inch hatchlings that weigh only 3/5 of an ounce. After nesting, the females travel long distances to their feeding grounds, which may be as far away as Cuba or the Dominican Republic. Ironically, there are also seemingly excellent nesting beaches in those regions. Why the loggerheads commute to the United States is anyone's guess. In the past, when turtles were more abundant in the Caribbean, the beaches there may have been fully utilized by greens and hawksbills. Along the Gulf of Mexico, Florida again claims the greatest nest count (between Pinellas and Monroe Counties) but the nests are far, far fewer compared to the Atlantic side. 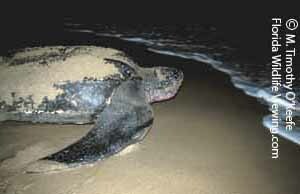 Sea turtles do not nest on the U.S. Pacific coast.